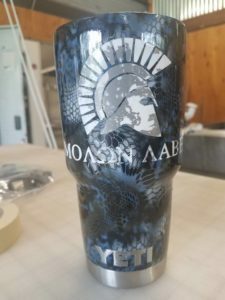 Our water transfer printing process is used to customize many items ranging from all-terrain vehicles and car dashboards, to small items like helmets, thermos cups or automotive trim. Films are applied to all types of non-porous material including plastic, fiberglass, wood, ceramics, and metal. For the most part, if the item can be dipped in water and can be painted and dipped using our technique. Our tanks and equipment are of commercial quality. We are able to do large jobs in a professional manner. This is how it works. The hydrographic film pattern of your choice is placed on the water’s surface in the dipping tank. The film is water-soluble, and dissolves after applying an activator solution. Once dipping is begun, the pattern will adhere and curve around any shape. Any remaining residue is then rinsed off thoroughly. The ink has already adhered and will not wash off. It is then allowed to dry and a clear coat is applied at the end. Our clear is a flat, high gloss, semi-gloss and many different colors of Kandy. We carry a large variety of films and the patterns are many, so please ask if you don’t see something you like. We can order almost any print if we don’t have it in stock.